Nine long months after being shut out of the pillow fort network for good, Maggie and Abby finally have a whole new mission to focus on—and this one starts with a return to the infamous Camp Cantaloupe. What neither of them expect, though, is for their first night at camp to go down in Cantaloupe history. And when that trap door busts open for the first time in centuries, Abby’s going to need the help of friends both old and new to help her uncover the truth—and get her back to Maggie's side before Camp Cantaloupe itself gets shut down...for good. Readers will love exploring a whole new network of magic in this twisty sequel, perfect for fans of Caroline Carlson and Kathryn Littlewood. Will Taylor is a reader, writer, bee fan, and former trapeze flailer. 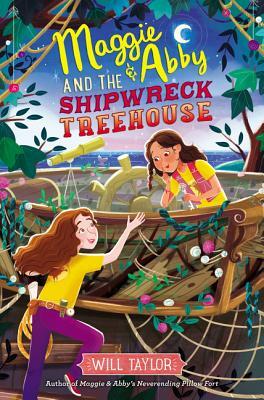 Maggie & Abby's Neverending Pillow Fort is his debut novel and is followed by Maggie & Abby and the Shipwreck Treehouse. He lives in the heart of downtown Seattle surrounded by all the seagulls and nearly all the books. When not writing, he can be found selling caramels for a local chocolate company or completely losing his cool when he meets longhaired dachshunds. You can visit him online at www.willtaylorbooks.com.